We are all attempting to improve our lives, while having a more fulfilling personal and professional life. We all experience peaks and valleys, that seem like a rollercoaster ride at times. I am always excited interviewing new authors who have spent much of their lives not only living in the peaks and valley, but finding ways to make life more fulfilling. 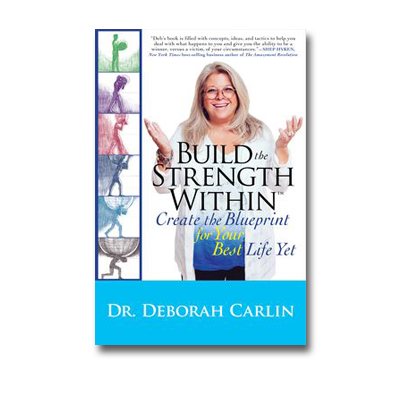 In my interview with Dr. Deb Carlin the author of “Build the Strength Within” we explore ways that she has found over the years with working together with her patients to create more exciting and fulfilling lives. Dr. Carlin has developed a blueprint for success, which focuses on intentional and integrated life. She has provided a guidebook with self-assessments and direction on how to live a fully integrated life, where we put our focust on all elements, mind body and spirit. Our mind is only part of the overall equation, but one element that I hear over and over again from our authors is our “self-talk script”, and in particular our negative self-talk. Dr. Carlin points out that we need to be comfortable in our own skin and be compassionate with ourselves and others. If we would just sit silently with ourselves, and breathe in the essence of life we could learn so much about our higher spiritual calling. Dr. Carlin’s book is a guide to building a new blueprint for your life. It is designed to get you thinking, assessing and acting on your vision for a better life. She has developed a series of extremely well produced videos that you can view by clicking here. This video series is provided at no-cost to the reader, and is a wonderful supplement to the book. As we approach the end of the year, most people are reassessing their lives, goals and vision for the future. I highly recommend “Build the Strength Within” as a wonderful book and tool to help you reinvent your current life into one with more passion, purpose and meaning. Enjoy my wonderful interview with Dr. Deb Carlin.